The April 2018 issue of The Cascadia Subduction Zone is out. 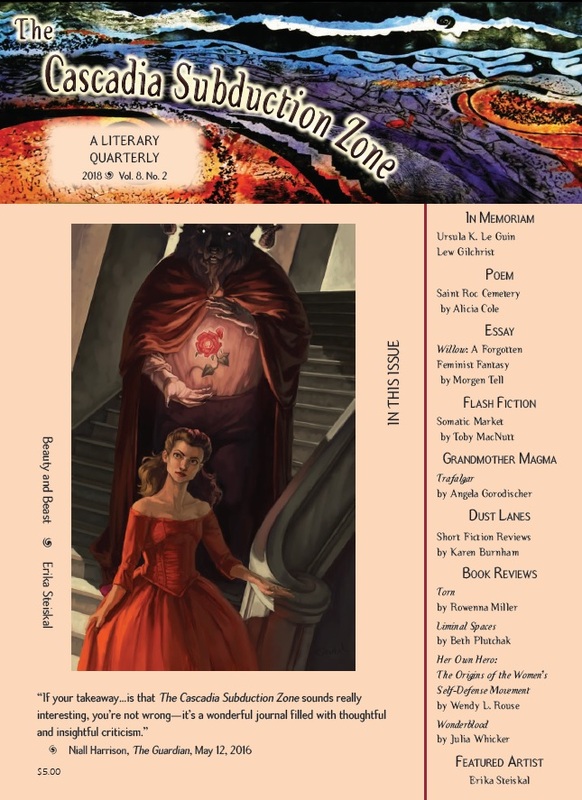 This issue includes short fiction by Toby MacNutt, a poem by Alicia Cole, an essay by Morgen Tell on a forgotten feminist fantasy film, a Grandmother Magma entry on Angelica Gorodischer by Cristina Jurado, a new column by Karen Burhnam, "Dust Lanes," reviewing short fiction, reviews by Arley Sorg, Nancy Jane Moore, and others, as well an appreciation of Ursula K. Le Guin by Nisi Shawl, and an appreciation of the CSZ's first managing editor, Lew Gilchrist, by Kath Wilham. The issue's featured artist is Erika Steiskal. The CSZ is available for purchase at http://thecsz.com/. Electronic copies are $3, print copies $5; electronic subscriptions $10, print subscripts $16.